My life started at an Amish puppy mill in PA. My foster grandpa saw me and knew I deserved better, so he bought me and brought me to NY to meet my foster mom. She started the hunt to find me my own loving family, but then I got really sick. I was diagnosed with a severe case of intestinal worms, and was so weak and ill, I didn’t eat for 5 days. My foster mom took me to Cornerstone (yay!) where they started fluid treatments, thank goodness. They are so kind there! After a week there and an ultrasound at Cornell, I finally ate!! Whew! The vets at Cornerstone say that I am a miracle pup, because I was so sick, they weren’t sure I would make it! 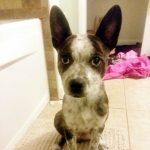 I am back to my old puppy self again– I am super friendly, very playful, and delightfully curious! I want to learn as much as I can so I check everything out. I am definitely a puppy, so of course my energy is high, but I also love to sit on my foster mom’s feet while she does the dishes! I am sweet and love to play! I am very cuddly!! I curl up on my foster mom’s lap or on her feet every evening. 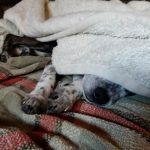 I sleep under the blankets with the 2 other dogs and I love to be warm! I sometimes snore, but not as loud as my foster dad!! I love to love! If I could be carried all morning, I would love it! I also enjoy laying in the bathroom next to the heater vent while my family is getting ready for the day. My toys are everywhere, I really enjoy playing whenever I can! 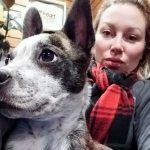 In my foster home, I am living with 2 small male dogs, and an old cat. They are teaching me that my food bowl is the only bowl I can eat from (darn! ), and we all share their really comfy beds. I love to run and play fetch! The human boy in my foster home is a good friend. He likes to run and play with me– we lap the fenced yard together! I recently learned how to use doggy doors! I was terrified at first, but now I zoom right through them. 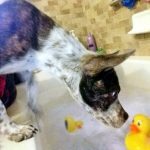 I also enjoy watching my human foster siblings in the tub, I almost fell in the tub last week! I have never gone swimming, but I can’t wait to try it! Since feeling better, I have become such a good listener! I am returning the balls when playing fetch. I am very food motivated, which is good since I did lose some weight while I was sick. I am working on basic commands, I love to sit and hope to ace the STAY request soon! I am a lover, and so far have loved all people whom I have met. I LOVE dogs! I have so much fun running and chasing! I cannot wait for the weather to break, but I don’t mind the mild winter days. My foster mom wants me to have a fenced in yard! The older dog in my home (his name is Pig!) has little patience for m. I sometimes playfully jump on him and try and steal his treats, and he thinks this is bad manners! But what can I say?? I love him (and am a bit of a rascally puppy)! I also live with a rescue Leopard Gecko named Norbert! I watch him from the couch and wag my nubby tail. Last week, my family went out and built a snowman, I barked at the snowman every day until he just melted. I am an awesome protector! I am fascinated by, and very good with, my foster cat sister—I really like to sniff her (and try and eat her food)! 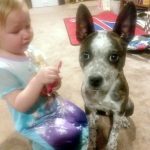 There is a 2 year old and a 6 year old in my foster home, but I would do best in a home with kids 6 and up. I am a puppy, and thus have sharp little teeth and nails, and I use my mouth a lot, as puppies do. I also like to jump up when excited, which isn’t good for toddlers. And sometimes when the 2 year old screams or cries, I get very scared and run and hide. Ditto when the 6 year old plays with his Nerf toys. He has never hurt me, but I get scared and run and hide. I would like a slightly calmer/quieter child environment, but I do really love kids! I also warn you, that as almost all puppies do, I like to explore all things in my world with my mouth, so toys and things that you don’t want me to chew on (Legos are my favorite! ), should be put away far out of my reach. Playing fetch, I could do it for hours! Eating, I just love to eat! Sitting on my foster mom’s lap! Playing with the other doggies in the house! Deagan the Brave came into his foster family’s life because he needed to be saved. He would never have made it without the awesome staff and loving hearts of everyone who believed he deserved a better life. Coming from a PA puppy mill to Ithaca, Deagan has received loads of love and basic training. Deagan’s foster family loves him, but with their senior dog, Pig, they do not want to add to the pack just yet. I am (now) very healthy! I thank my ladies at Cornerstone for taking such good care of me! I am fun, smart and sweet. I deserve a loving active family that will keep me forever, I would do better with a playmate, but if my new parents took me places, I would be fine being the only pup in the house. Please consider adopting me so we can start having fun!! If you are interested in adopting me, please fill out an online adoption application and we will forward it to Deagan’s family. 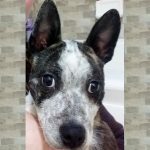 Boston Terrier, Cattle dog, good with cats, good with dogs, good with kids, male, puppy, small, young. Bookmark.